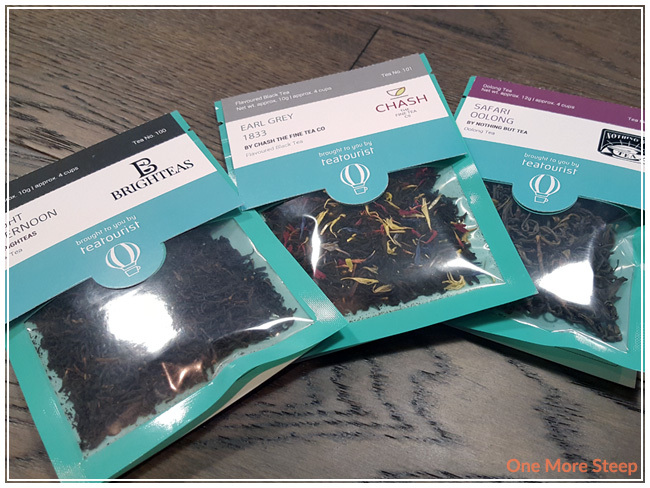 Teatourist has provided me with the Ravish & Lavish Tea Adventure for the purposes of providing an honest review. 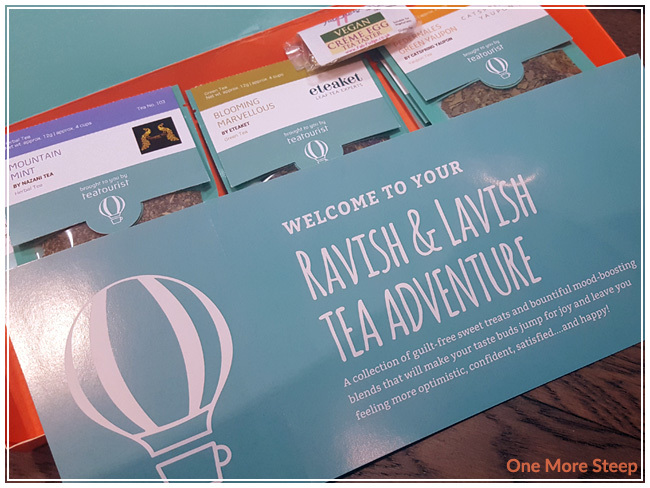 I was really excited with the Ravish & Lavish Tea Adventure because the first item I really laid eyes on was the complimentary brew buddy, which was the Vegan Creme Egg Fudge by Fab Fudge. I pretty much ate that quick and it was delicious! It had a lovely chocolate texture and reminded me a lot of a Cadbury Creme Egg. There’s not a lot of photos that I took of that one, unfortunately. The only thing that would have it better if there had been more of it. This collection had six teas: Mountain Mint by Nazani Tea (herbal infusion), Blooming Marvelous by eteaket (green tea), Pedernales Green Yaupon by CatSpring Yaupon (herbal infusion), Shakti Masala Chai by Sonya’s Chai (black tea), Belgian Chocolate Rooibos by Cheshire Tea (rooibos), and Breakfast In Bed by teatourist (black tea). 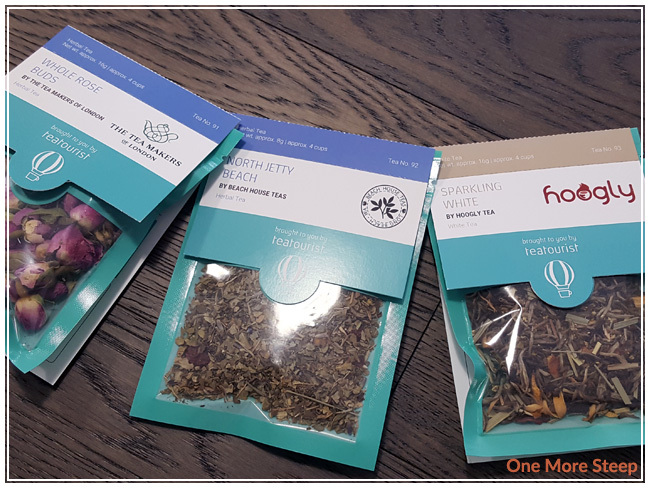 From what I learned from teatourist, this is their first signature tea blend, so I was really looking to trying it when I saw it! Mountain Mint is an herbal tisane that I would describe as being very fluffy. It just has a very fluffy, airy dry leaf. This mint tisane is 100% wild mountain mint and harvested 1800m above sea level. It has an obviously minty aroma to it. Blooming Marvelous has a very strong strawberry aroma to it, which is quite nice. It’s made up of green Chinese sencha, rosebuds, strawberries, mallow, sunflower petals, and natural flavouring (lemon, vanilla, and red fruit). Now, I’m not sure what ‘red fruit’ is, but I’m assuming it helps to amplify the strawberry flavouring of the tea. Pedernales Green Yaupon has flakey dry green leaves. There’s something about the aroma of this yaupon that reminds me of kale. Pedernales Green Yaupon is 100% organic yaupon. From left to right: Mountain Mint, Blooming Marvelous, and Pedernales Green Yaupon. Shakti Original Masala Chai has some strong spice aromas from the dry leaf, I can smell primarily the cardamom, clove, and black pepper. 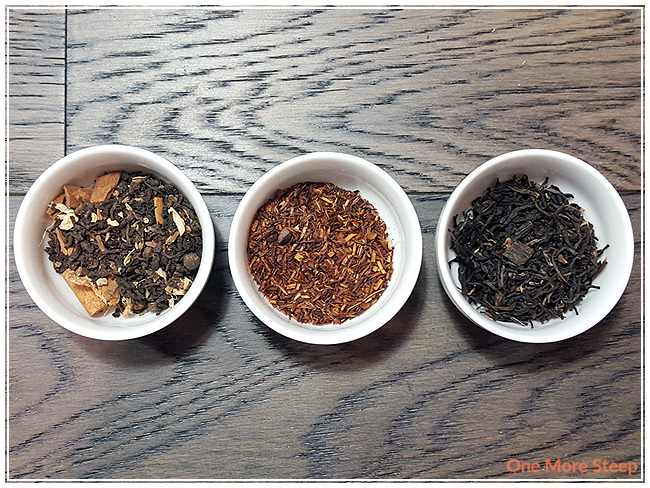 This chai consists of Assam black tea, cinnamon, ginger, cardamom, anise seed, black pepper, clove, and fennel. 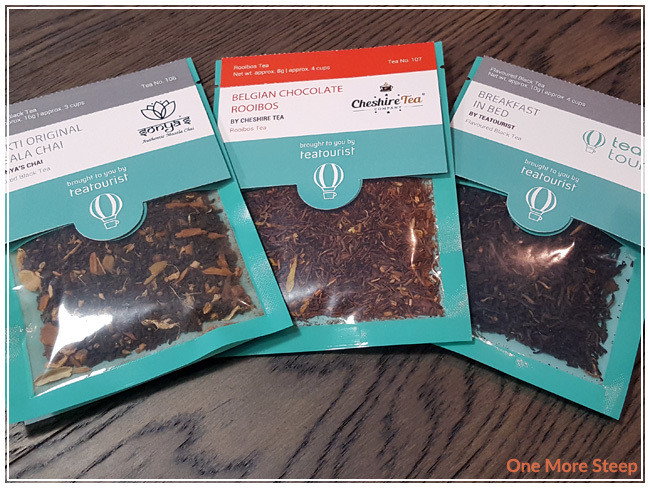 Belgian Chocolate Rooibos has a sweet chocolate aroma, along with the medicinal aroma from the rooibos base. 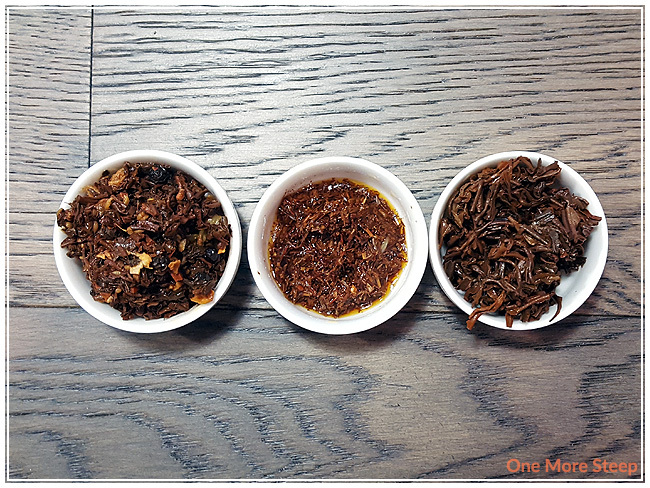 It consists of rooibos, cacao bean pieces, calendula petals, and natural flavours. Breakfast In Bed has a strong black tea aroma, and I can smell and sweet the vanilla bean pieces. The aroma makes me think of cake, but I believe that to be due to the vanilla bean. 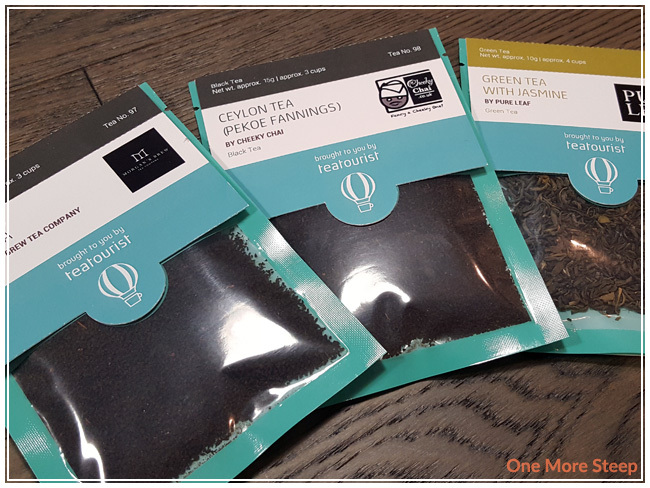 Teatourist’s signature blend consists of black tea, vanilla pieces, and flavouring. From left to right: Shakti Original Masala Chai, Belgian Chocolate Roobios, and Breakfast In Bed. Nazani Tea recommends steeping Mountain Mint in 100°C (212°F) water for 4 to 5 minutes. I did an initial steep of 4 minutes. eteaket recommends steeping Blooming Marvelous in 80°C (176°F) water for 2 to 3 minutes. I did an initial steep of 2 minutes in 79°C (175°F) water. CatSpring Yaupon recommends steeping Pedernales Green Yaupon in 95°C (203°F) water for 3 to 5 minutes. I did an initial steep of 4 minutes in 93°C (200°F) water. Sonya’s Chai recommends steeping Shakti Original Masala Chai in 100°C (212°F) water for 4 minutes. I followed the steeping instructions for the initial steep. Cheshire Tea recommends steeping Belgian Chocolate Rooibos in 100°C (212°F) water for 3 to 7 minutes. I did an initial steep of 5 minutes. teatourist recommends steeping Breakfast In Bed in 100°C (212°F) water for 4 to 5 minutes. I did an initial steep of 4 minutes. Mountain Mint steeps to a nice orange colour. It has a minty aroma, and has a great minty flavour to it. The description on the packaging described it as being both warm and refreshing, which I do agree with. I think it’d to have iced this summer. Blooming Marvelous steeps to a light yellow colour. I can taste the sencha base, it has a pleasant vegetal flavour to it. I found that it had a nice light fruity sweetness, and pleasant floral notes to it. The strawberry/berry flavours shine through when I sip at this one. Pedernales Green Yaupon steeps to a brownish-yellow. I found that it has a bit of a spinach and earthy aroma to it. There’s a very light sweetness to it, and some earthy notes in this infusion that reminds me a lot of dark green leafy vegetables and mushrooms. Shakti Original Masala Chai steeps to a deep red. I found that it had a nice spice aroma and flavour to it. I like my chai a tiny bit sweeter than this one is, so I did add a little bit of honey. I can definitely taste the ginger and cinnamon in it. This chai blend also goes well with a splash of milk. 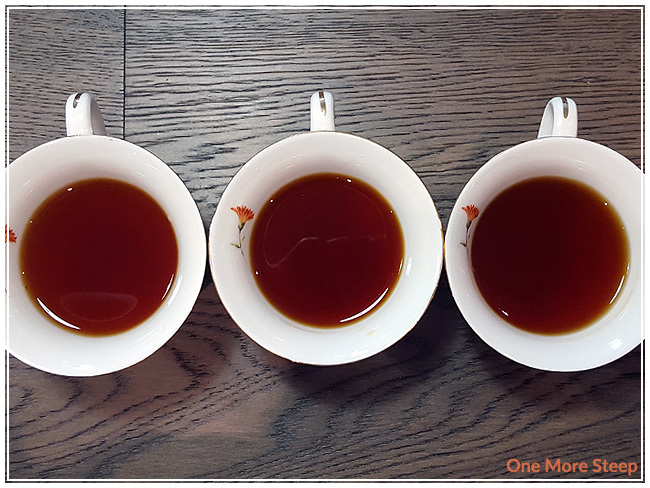 Belgian Chocolate Rooibos steeps to a deep red. I found the chocolate aroma wasn’t very strong compared to the smell of the rooibos base. The chocolate flavour was very mild compared to the medicinal flavour of the rooibos. Breakfast In Bed also steeps to a deep red. There’s a slight sweetness to this black tea, with a nice vanilla flavour. 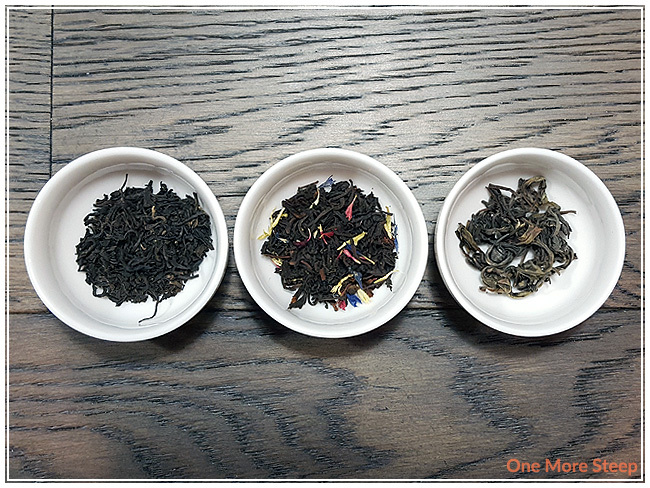 The black tea base has a touch of astringency to it, which isn’t overwhelming the vanilla – it reminds me a bit of a breakfast tea (either English or Irish). The vanilla adds a bit of creaminess to the tea. I think it’d do well with some cream and sugar. For the first trio, I attempted resteeps for all three. Mountain Mint did well on the first resteep at 7 minutes and had an enjoyable flavour. In a second resteep attempt, Mountain Mint did poorly, it’s a tisane that is good for just the one more steep. Blooming Marvelous didn’t do well on the resteep, I found that the flavour profile wasn’t similar to the initial steep. The sencha was the main star for the resteep, so if you’re like sencha, you’ll probably enjoy the resteep of the same leaves. Pedenerales Green Yaupon tasted fairly similar to the initial steep with those earthy flavours. 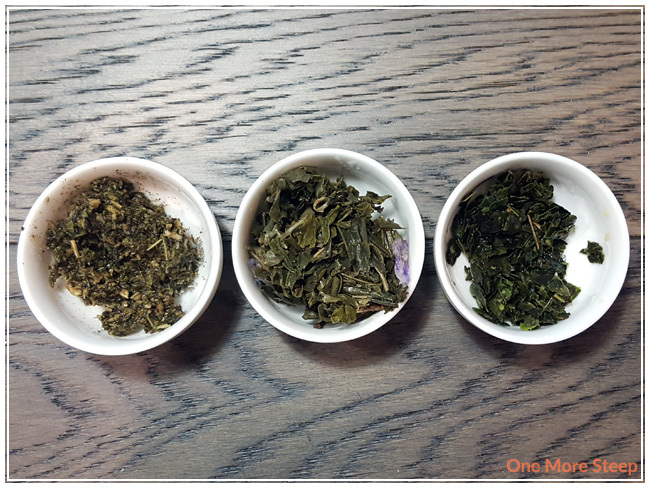 In the second half of the Ravish & Lavish Tea Adventure, I resteeped all of them once. I found that Shakti Original Masala Chai wasn’t quite as spicy as the initial steep. It’s still tasty, but the flavour wasn’t as intense as the first steep. Belgian Chocolate Rooibos didn’t do that well with the second steep, I found it to be all rooibos with no chocolate flavour to it. Breakfast In Bed resteeped well. The vanilla flavour wasn’t as strong as the initial steep, but it was noticeable. The black tea still had a mild astringency to it, but wasn’t off-putting. 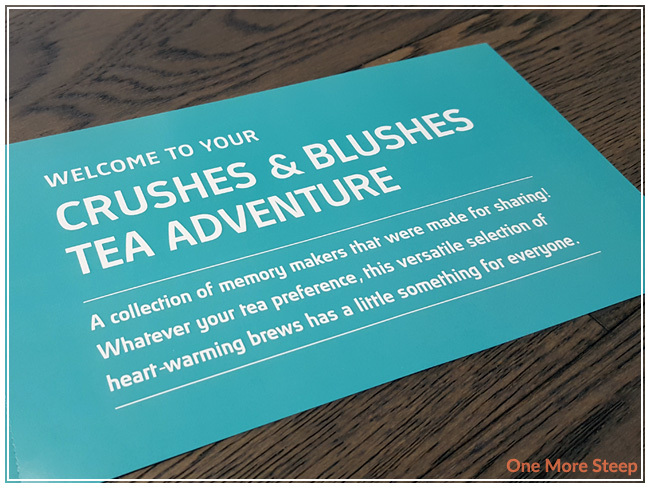 I loved Teatourist’s Ravish & Lavish Tea Adventure. 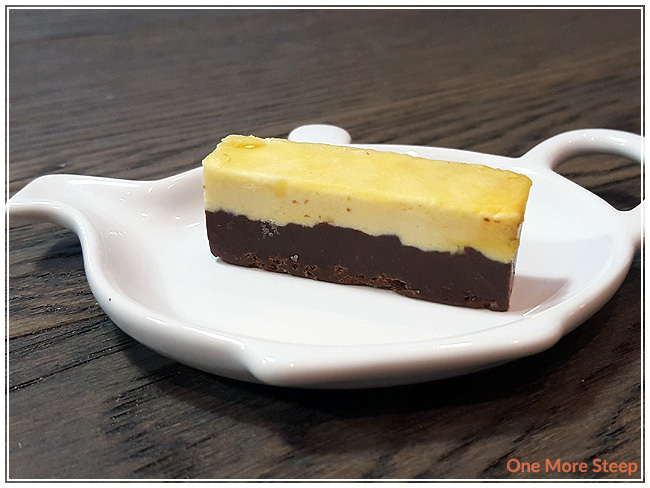 I really did enjoy the Vegan Creme Egg Fudge, it was a very tasty morsel! The stand outs in this collection for me were Blooming Marvelous, Shakti Original Masala Chai, and Breakfast In Bed. 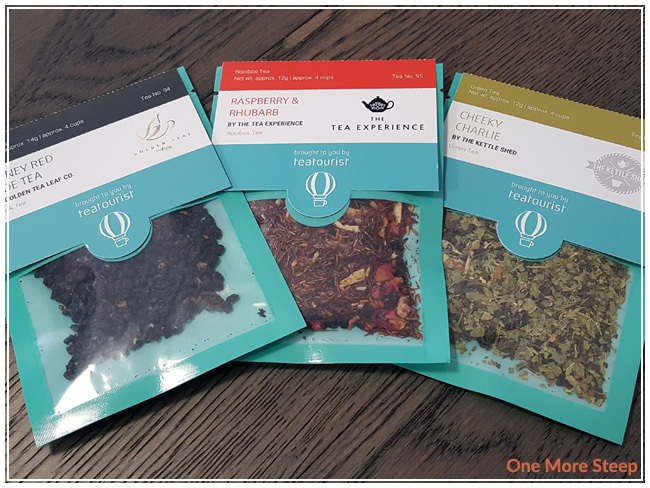 I really enjoyed the black teas in this collection, and getting introduced to all these flavour combinations is one of my favourite parts of receiving a monthly subscription box. 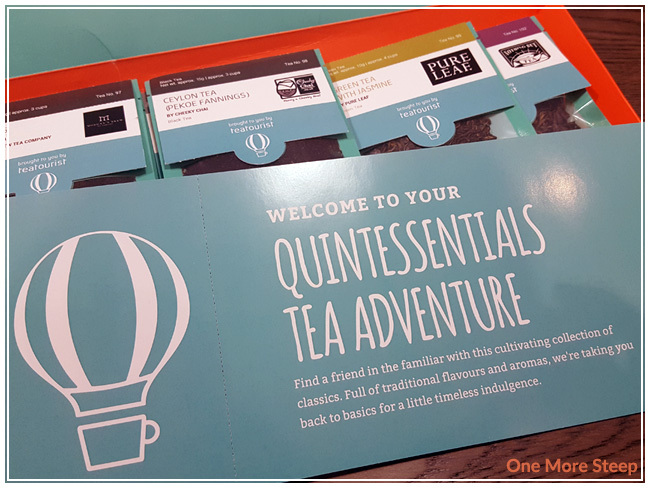 The fun part of the boxes is getting teas that I probably wouldn’t buy on my own, but then I would have missed out of getting to try them. I really would recommend trying it out if you have the spare funds because it’s a really fun treat. 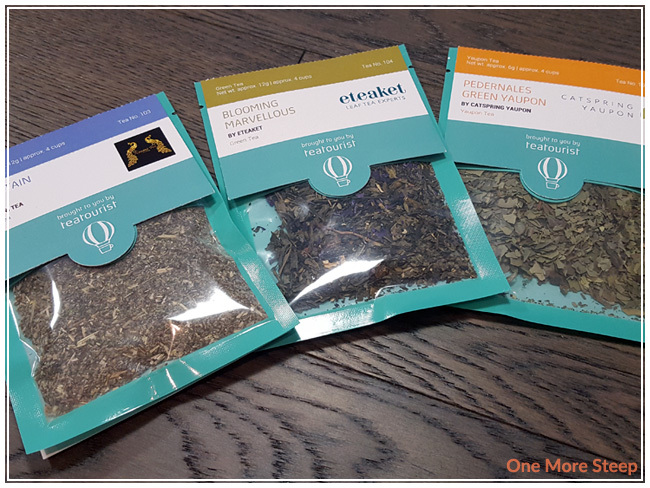 Teatourist has provided me with the Quintessentials Tea Adventure for the purposes of providing an honest review. The teas in this box are: Morgans Brew Tea by Morgan’s Brew Tea Company (black tea), Ceylon Tea by Cheeky Chai (black tea), Green Tea with Jasmine by Pure Leaf (green tea), Bright Afternoon by Brighteas (black tea), Earl Grey 1833 by CHASH The Fine Tea Co (flavoured black tea), and Safari Oolong by Nothing But Tea (oolong). Morgans Brew Tea has a strong smell to it that reminds me both of a breakfast tea (think British or Irish), while having some apricot notes in the dry leaf. This straight black tea is a blend of a few East African black teas (from Kenya, Uganda, and Rwanda). Ceylon Tea (Pekoe Fannings) has a mildly sweet aroma, and has a very familiar black tea aroma to it. Ceylon Tea consists of 100% small leaf ceylon tea (pekoe fannings). Green Tea with Jasmine smells exactly as expected (like green tea and jasmine) and, surprise, consists of Chinese green tea and jasmine flowers. 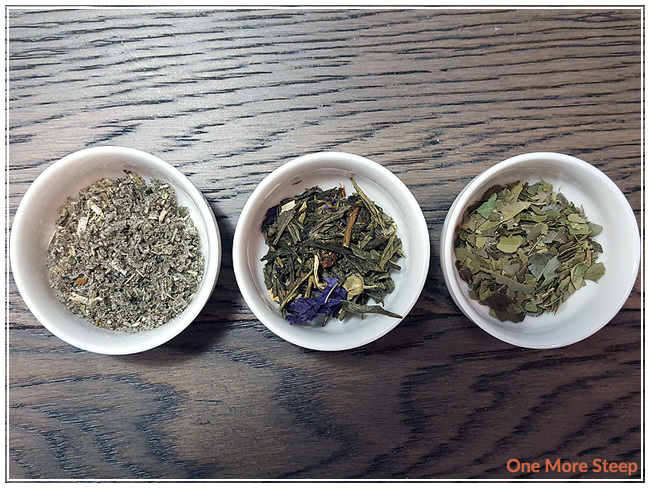 From left to right: Morgan’s Brew Tea, Ceylon Tea, and Green Tea with Jasmine. Bright Afternoon has an interesting aroma that reminds me of a fresh after-rain smell, and has some mushroom-earthiness to it. 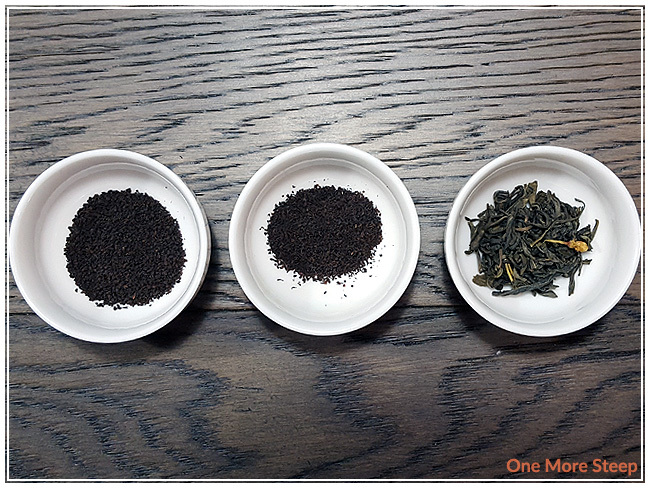 The ingredients in this black tea are Chinese Keemun, Mao Feng, and Yunnan black teas. Earl Grey 1833 has a lovely bergamot/citrusy aroma to it, and smells like most Earl Grey teas that I’ve smelled in that past. 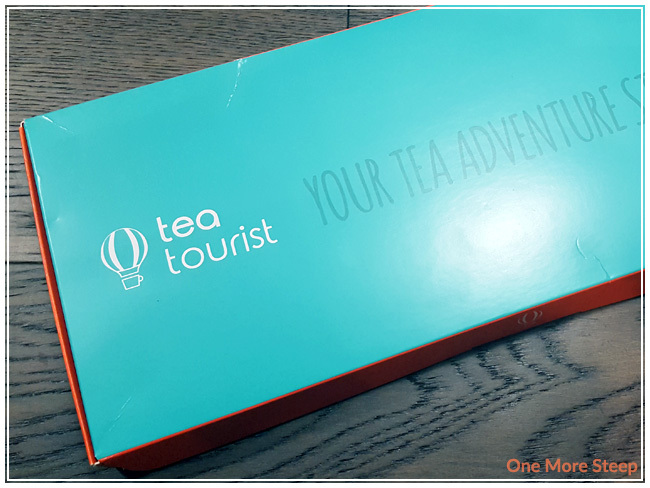 Curiously, the ingredients are listed as being the finest Ceylon black tea and pure bergamot oil. However, there’s obviously flower petals in the blend that aren’t listed in the ingredients. Safari Oolong is the most intriguing to me, as it has a very light honey and floral aroma to the dry leaf. Safari Oolong is 100% oolong tea from Tumoi Teas, located in Nandi Hills, Kenya. 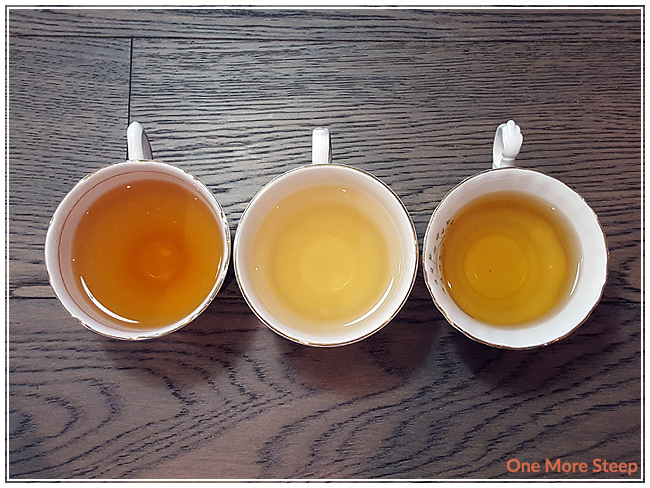 From left to right: Bright Afternoon, Earl Grey 1833, and Safari Oolong.